The red copper pan rose to popularity, thanks to the endorsement of Cathy Mitchell, a best-selling author and TV infomercial host. This pan is a combination of copper and ceramic. Because it is integrated with copper, it boasts of durable and resilient properties. Its ceramic surface prevents food from sticking to it. Many home cooks and chefs are drawn to the properties of the red copper pan. It is supposedly PFOA and PTFE-free, great for those conscious about unhealthy chemicals in their pan getting in their food. Its versatility knows no end as well. It is mainly used for cooking on a stovetop, but you should have no problems using it in the oven as well. Aside from its aesthetics, a red copper pan is a great addition to your cooking arsenal because of its good heat conductivity. It distributes heat evenly, which goes a long way in producing delicious home-cooked meals. Even new home cooks will have no trouble cooking with the help of this pan as it doesn’t cause food to burn easily. You also save on electricity or gas. Since it heats up faster and distributes heat better than standard pots, your cooking time shortens. It’s also a pan that is a cinch to clean. Since food residues and grease don’t stick to its inner surfaces, you can just wash it with ease after using it. Another great thing about red copper pans is that they are highly durable. 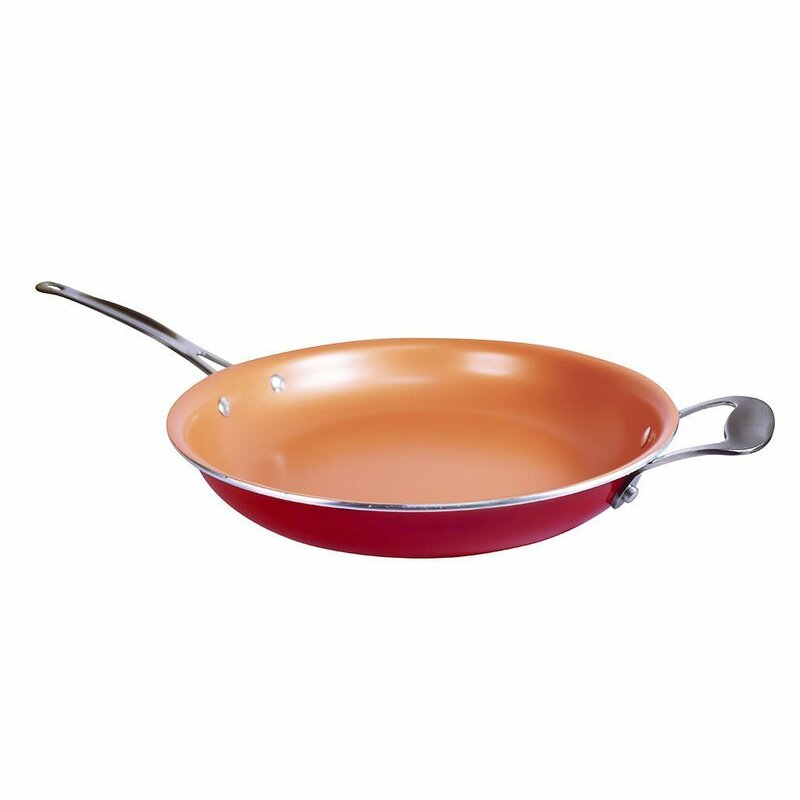 Some red copper pans can even withstand temperatures of up to 500 degrees Fahrenheit. That said, a red copper pan is one kitchen utensil you can always rely on to perform an assortment of cooking tasks such as baking, frying, braising, and even flambéing. This Bulbhead red copper pan can be a great addition to any kitchen because of its attractive design and all-around use. If you plan on starting a healthier diet, you can use this pan as your ally in achieving that goal. This red copper pan is made with an entirely non-stick cooking surface that ultimately eliminates the need to use fat, grease, or butter. With this pan in your possession, you will be able to cook multiple types of meals including baked and flambéed ones. What’s more is that this product is highly scratch resistant, making it easy to clean and dishwasher safe. It also has a unique square shape, which allows you to cook more food in one go. You can cook more food, thanks to its bigger cooking surface. If you feel like getting a whole red copper cookware set, I recommend you check out this one made by BulbHead. This 10-piece cookware set can be a great addition to your kitchen because it comes with a classic look that can match your kitchen whatever its interior design is. This cookware set is a starter set that you can use for all your cooking needs. You can fry, stew, steam and make soups and sauces with all the pots and pans included in this set. What’s more is that it’s very easy to clean. You don’t even have to use a rough dishwashing pad or scraper with this one because of its ceramic cooking surface that doesn’t let any type of food stick to it. Moreover, all of the utensils included in this cookware set is completely PFOA or PTFE free, making it ideally safe for cooking and preparing food. 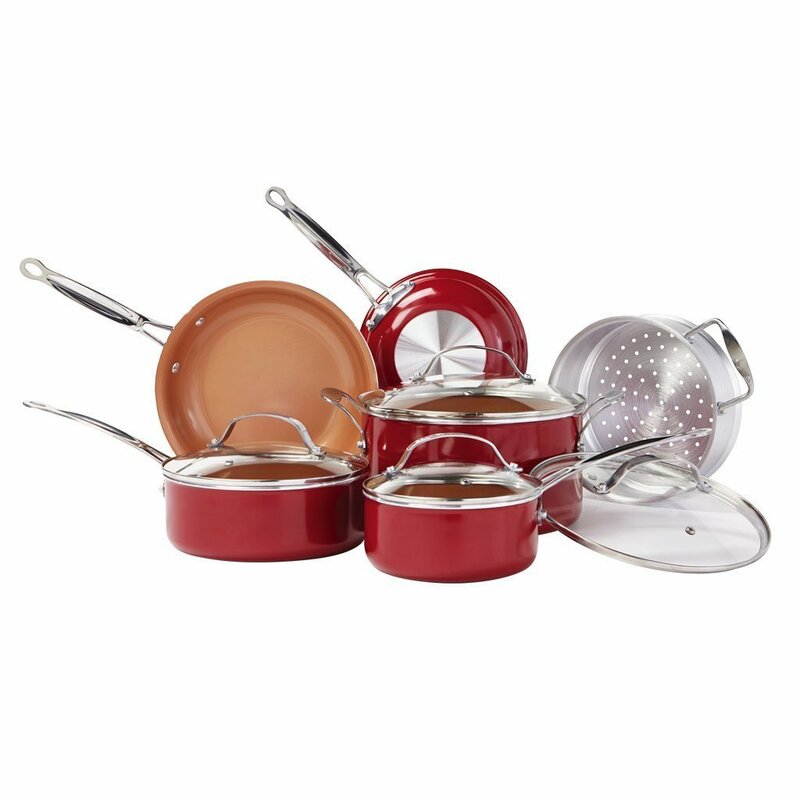 If you are just starting to like red copper products, I suggest you try and see this small 5-piece red copper cookware set. Just like most red copper product in this list, this cookware set will offer you a way to cook your meals in a healthier way. This set comes with PFOA and PTFE free utensils that don’t only offer a way to cook without oils but also add safety since it doesn’t come with risks of chemicals leeching into your food. Another great thing about this set is that it’s very versatile. You can even use it for baking since it is made to withstand temperatures up to 500 degrees Fahrenheit. If you are looking for a medium sized red copper pan that you can use to cook all sorts of dishes in your kitchen, then you might want to get this 10-inch copper ceramic non-stick pan. This pan is the ideal cooking pan. It has a great size that’s ideal for cooking different meals such as pasta﻿﻿﻿, steak, pancakes, and even soups and stews. Just like other red copper products, this one also offers a completely non-stick cooking surface that makes for healthier cooking. What’s more is that this product is completely dishwasher safe since it is made with scratch-resistant materials. This is very good news, especially if you don’t like spending a lot of time scraping off food as you clean the dishes. 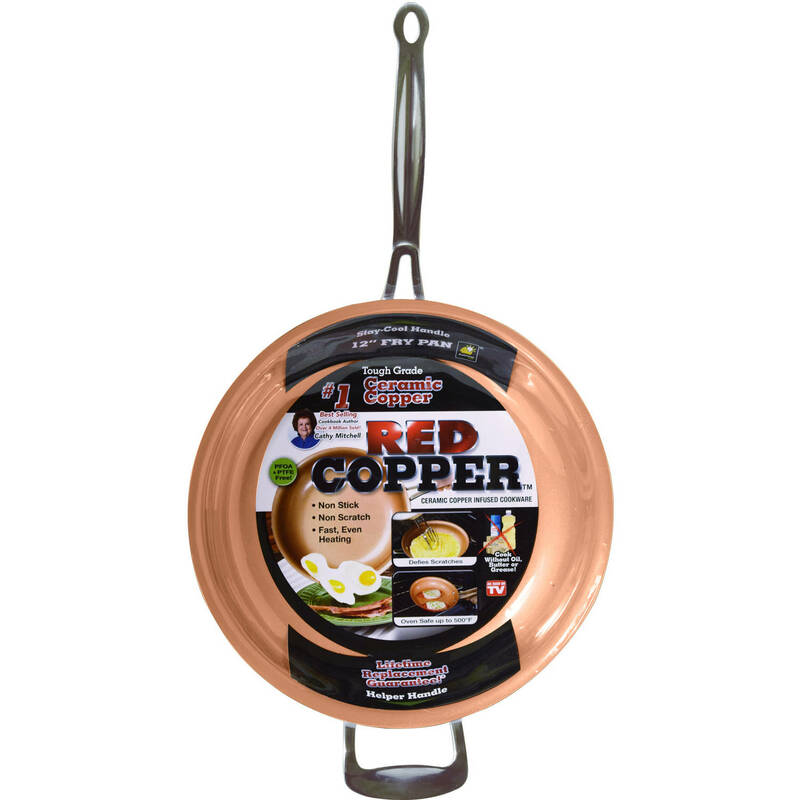 Another great red copper frying pan in this list is this 12-inch red copper fry pan deluxe. 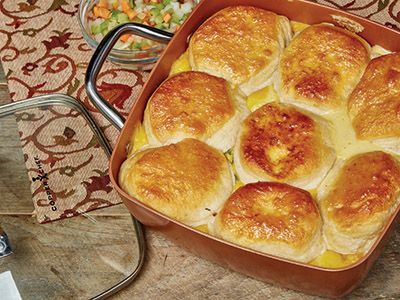 This pan has a really large size that makes it ideal for cooking large family meals. What I like best about this pan is that you can easily make a batch of pasta with it since it can hold a lot of water. 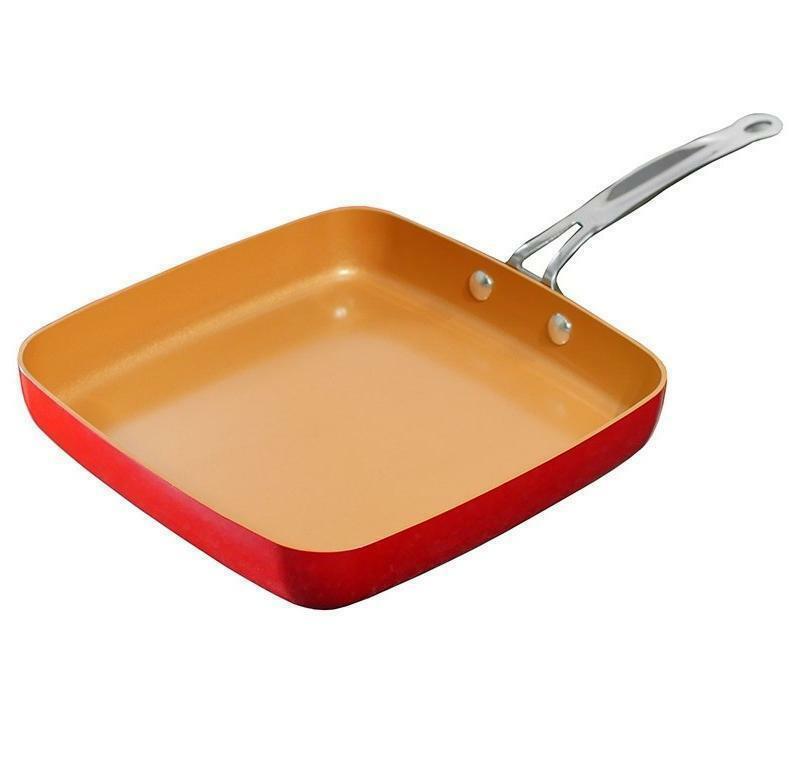 Aside from its very accommodating size, this red copper pan also comes with the typical benefits associated with other red copper products such as a completely non-stick cooking surface, good heat conduction, versatility, and ease of use and cleaning. So, which of these pans should you ultimately go for? It really depends on your needs. We suggest getting the Bulbhead Red Copper Square Dance Non-Stick Ceramic Cookware if you are looking for a basic pan that can be an all-around pan for your cooking needs. It’s great for all kinds of home cooks out there. For those who want to save time and money in buying different kinds of cookware, just get yourself the Bulbhead Red Copper Ceramic Non-Stick 10 Piece Cookware Set. It comes complete with all the things you need to whip up delicious meals. 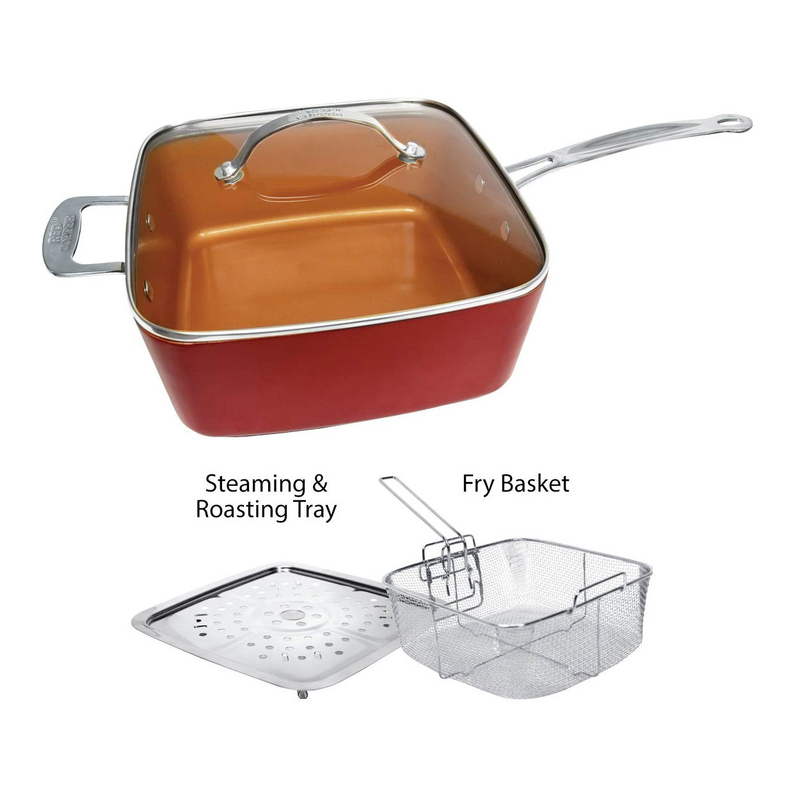 We recommend the Red Copper 5 Piece Cookware Set for people who do a lot of frying at home. The pan is deeper, so you can use it as a deep fryer. This can also be a great ally for baking. 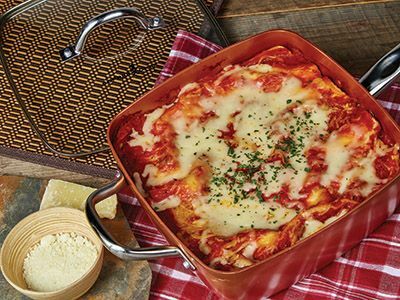 You can’t go wrong with the 10-inch Red Copper Ceramic Non-Stick Cookware Pan. It’s inexpensive, ideal for those trying to save money. It’s a basic fry pan that you can use for a long time. 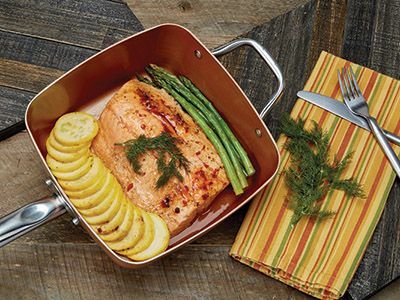 It’s very similar to the 12-inch Red Copper Fry Pan Deluxe but this one offers a bigger cooking surface. Go for this if you tend to cook more portions of meals. 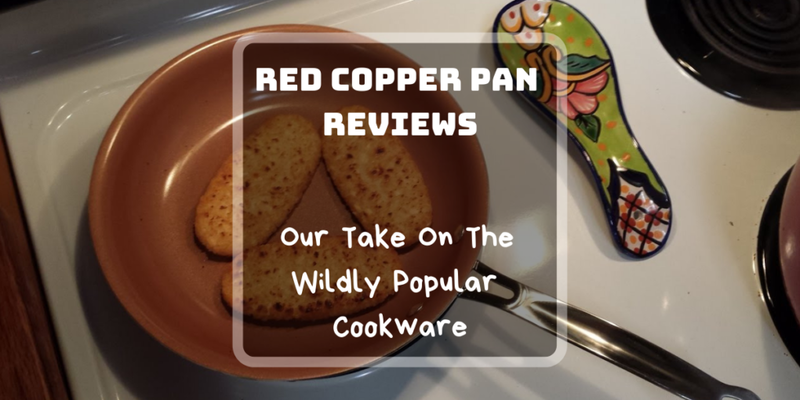 If all you want is a copper pan with a good design, great features, and the best quality, then the best red copper pan is the Bulbhead Red Copper Square Dance Ceramic Cookware Non-Stick. If you tend to do a lot of frying at home, it makes more sense to buy a red copper pan that is deeper and includes a frying basket, so you can get this job done with ease. If you cook meals for a big family, go for those pans that are bigger, so you can cook more food in one go. Look for a pan with a size that corresponds to your particular needs, so you can rely on that for everyday cooking. 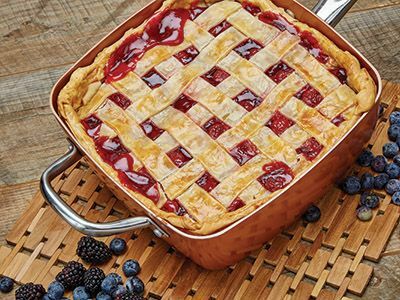 Set aside a budget for it and make sure you are getting a pan that fits within your budget range. Just make sure you are reasonable about your budget, so you will end up getting a good one. Find out what other people are saying about the copper pan. Are they satisfied? What problems did they experience? Do they recommend it to other buyers? The point of buying a red copper pan is to have a reliable cooking tool that will stay in your possession for a long time. You would want it to be highly resistant to scratches. So, make sure you buy one that can last for a long time even with minimum maintenance. Make sure it is backed by a warranty. Just like when buying other products, make sure the red copper pan you are getting is backed by a warranty. In case you have issues with the pan, you can get the manufacturer to replace the product. Make sure you check out our suggested products, click those links and learn more about their individual features. If you are looking for more kitchen products to add to your cooking repertoire, go to our homepage. You can read a lot of reviews and discover more cooking products that will make your life in the kitchen a lot more convenient.